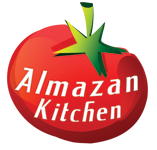 The traditional New York City dish with a notch of AlmazanKitchen improvisation! Perfect breakfast includes poached organic eggs, creamy hollandaise sauce, outstanding crispy homemade bacon and fresh bread… What a combo! If you ever wanted learn this recipe now is your chance, don’t miss it! Add 3 egg yolks with 1 tbsp. of butter then whisk it. Put the pan on coals for half of a minute, but do not let eggs. Add 1 tsp. of pepper and ½ cup of homemade white wine, stir well. Transfer the sauce to the wooden bowl. Fill the pan with water for like 1.5-2cm layer to boil it and fry at the same time. Crack few eggs and get rid of whites butnot of all of it. A little bit of olive oil to the bread slices. Fry bread until crispy. Flip halfway. Slice the homemade pancetta and fry it. Build the dish: bread, bacon, egg, sauce. Finish off with chopper spring onions. why the video is unavailable?